I've just discovered that Carcanet included Reed's underappreciated longer poem, "The Auction Sale," in a 2010 anthology of work originally published as Greville Press pamphlets: A Field of Large Desires. 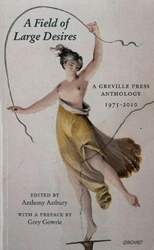 Edited by Anthony Astbury, who opened the Greville Press (officially) in 1979 in the hopes that poetry in England "will happen again," the new collection is "both a treasure trove and a celebration of a remarkable venture." Man greatest in himself, and others lives. The anthology includes pieces by Robert Bridges, Hart Crane, Elizabeth Daryush, Lawrence Durrell, Kate Ellis, David Gascoyne, W.S. Graham, Robert Graves, Ian Hamilton, John Heath-Stubbs, George Herbert, John Masefield, Edna O'Brien, Harold Pinter, Anne Ridler, Alan Ross, Martin Seymour-Smith, C.H. Sisson, Stevie Smith, and Arseny Tarkovsky, among others. Henry Reed's "The Auction Sale" was printed as a Greville Press pamphlet in 2006. It's nice when the little things can still make you happy. The littlest of things. Thimbles. Banker's clips. Very small rocks. Or how about, let's say... the oldest citation for Henry Reed to appear in print? The Bookman ("I am a Bookman." James Russell Lowell) was a monthly literary magazine published in London by Hodder & Stoughton from 1891 until 1934. Essentially a catalog of their forthcoming books and publications, it also contained reviews, bibliographies, advertisements, and illustrations. 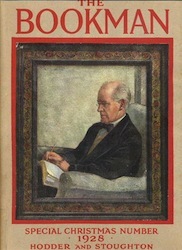 Like most magazines of the time, The Bookman staged a continuous variety of writing competitions, inviting submissions on such varied subjects (some of which pertained to the issue in hand) as: "best original lyric"; "best epigram on an Income Tax Collector"; "best acrostic on the name of any author mentioned"; "best review, in not more than one hundred words, of any recently published book"; "best 14 lines of verse containing the largest number of examples from the winning list of hackneyed quotations from the competition in the previous number"; etc. Prizes for the winning entries ranged from half a guinea to up to a gift of three new books. Runners-up might be selected to appear in print. 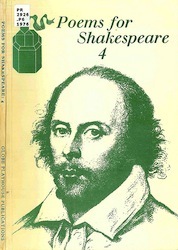 A Prize of Half a Guinea is offered for the best quotation from English verse applicable to any review or the name of any author or book appearing in this number of The Bookman. Winners were listed the next month, in November. The entry which received the half-guinea came from one B.M. Beard of Bexleyheath, Kent, with a lyric from Ruddigore by Gilbert and Sullivan: '...blow your own trumpet, / Or, trust me, you haven't a chance!' as it applied to the book How to Secure a Good Job, by W. Leslie Ivey (London: Sir I. Pitman & Sons). no. 446 (November 1928), p. 117. 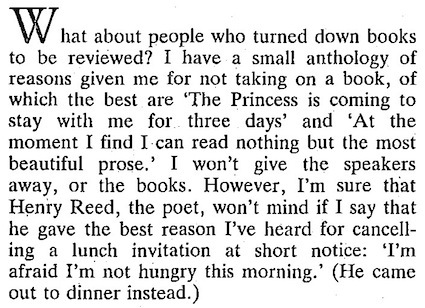 This tiny portrait is exciting for several reasons: Reed was barely a teenager in 1928, attending King Edward VI Grammar School in Aston, Birmingham, and yet here he is, reading and following a London literary magazine, already adept at wordplay and pun construction. He would eventually win a 1941 New Statesman competition calling for parodies of T.S. Eliot. Kipling's poem, "If," was first published in 1910, and it quickly became (and still remains) not only Britain's favorite poem, but Britain's most-parodied poem. It must have been taught in every classroom and repeated at every recital during Reed's childhood. (See the terrific digital collection for "If" at Dalhousie University, with images of both broadsides and multipage editions.) Finally, this is the only record I've found in print of Reed using the address of his childhood home in Erdington. I had to look up the value of the prize, to see just how heartbroken Reed must have been when he lost the competition. Half a guinea was the equivalent of 10s 6d, or 55p. It would have been worth about the cost of a brand new novel. I remember the poet, Henry Reed, telling me of a professor at Birmingham University, where Reed studied, who told him that he must correct his grammar before he could become a poet. Reed did so: Clare not only did not do so, but after some early attempts resolutely refused to comply. The strangest and certainly most moving talk programme of the week was A.M.D. Hughes's Personal Anthology on Radio 3, which among other things demonstratedin this period of celebration, when the supposed golden age of radio must often be sounding on tin earsthat old men do not forget. Hughes, approaching his 100th year (Radio Times got this right but R.D. Smith, introducing him on the air, managed to lop off a decade), used to teach English to, among other, the young Henry Reed and Kingsley Amis. He recited out of his blindness Hardy, Milton, Wordsworth, Arnold and Shelley, with an exalted and totally unfashionable inflection that demanded complete attention. He certainly got mine. For his performance of 'The Convergence of the Twain' alone this programme deserves a place in the archives, along with those crackling atmospheric fragments of Browning and Tennyson. Professor Arthur Montague D'Urban Hughes, Emeritus Professor of English at Birmingham University, died on Friday at the age of 100. He was widely known for his critical book The Nascent Mind of Shelley, published when he was 74. Hughes was born at Worthing, Sussex, on November 3, 1873, the son of the Rev Edwin M. M. Hughes. He was educated at St Edmund's School, Canterbury, and St John's College, Oxford, and became a lecturer for Oxford's Extension Delegacy. He was English Lektor at Kiel University 1905-14 and a member of the staff of Oxford University Press 1915-21. He was a lecturer in English at Birmingham from 1921 to 1931; and he lectured at St John's College, Oxford, from 1923 to 1929. He was appointed Reader in English at Birmingham in 1931 and Professor of English Language and Literature in 1935, retiring in 1939. He was made emeritus professor in 1940. He married in 1906 Wilhemina Langenheim, of Kiel, Germany, and they had a daughter. And so the circle of teaching is complete!